We're kicking Intros off with Botanic Thanks! Much like the Botanic Hello, Botanic Thanks features the word "thanks" in front of a cluster of florals. We love the size and simplicity of use with this stamp set! As you can see below, I found it very hard to put this down as you can create and color this set in so many different ways! I filmed the video for the card above, just some basic coloring with Copic markers. 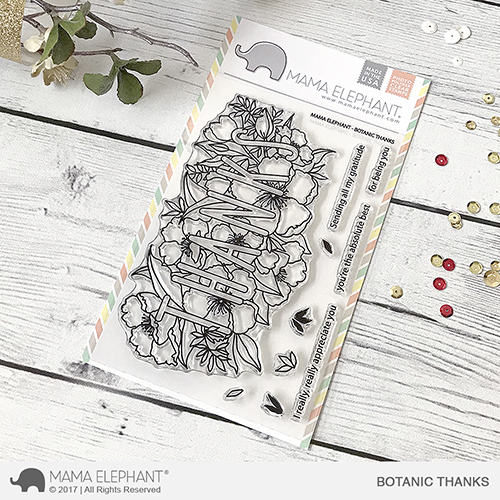 How will you color this statement stamp set? Comment below! I think I would use bold colors on the flowers and keep the letters white so they pop... and then maybe some glossy accents on the letters! Oh I am in LOVE!! Every single one of your cards ROCKS. I like that you colored it four different ways too. So many options! Since I'm not good at coloring, I like the option of keeping the flowers more subdued and brightly coloring the word as shown in the second design! All of the cards are lovely and this stamp is fantastic!! Yay! So happy your making another one with the word thanks!! Perfect!! gorgeous!!!!!! looking forward to the next botanical with LOVE on it, perhaps??? oh, pretty please!!!!! Oh wow, gorgeous, I love them all but I think I would do the color one against the kraft. That is so unique! Pretty and the kraft card one is gorgeous! I would colorthe flowers in the same colors just different shades light to dark. Beautiful cards and this stamp is on my shopping list! That's a beautiful stamp ! !